SPARTA — For the fourth time this season the Cannon County Lionettes got the best of rival DeKalb County here Monday night. In doing so, the Cannon County girls assured themselves of at least two more games this season — the finals of the Region-AA Tournament here Wednesday, and a Sectional game Saturday. Regardless of whether the Lionettes win or lose Wednesday, if they win Saturday they will play in the state tournament in Murfreesboro, which begins March 10. The Lionettes had to rally to record their fourth win this season over the Lady Tigers. Cannon County trailed 11-10 at the end of the first quarter and by a bucket at the half, 23-21. The Lionettes turned the tide in the third quarter, outscoring DeKalb County 18-12 in the period to go ahead 39-35. They again held the scoring advantage in the fourth, 20-13, and went on to a 59-48 victory. Game time here Wednesday for the 4-AA championship is 7 p.m. The tournament is being played in White County High School. 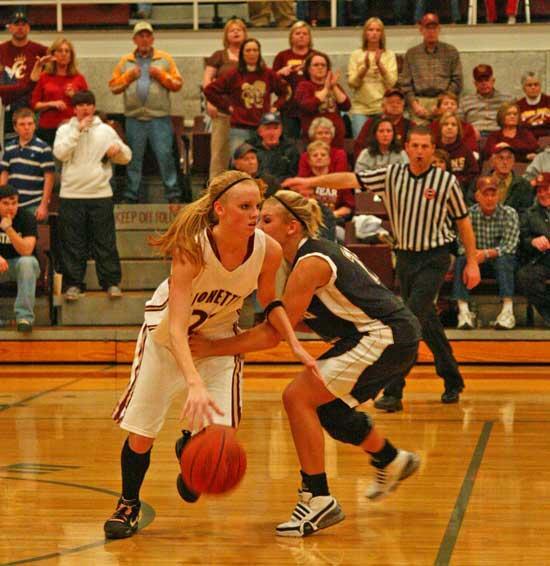 The Lionettes will be pitted against their biggest nemesis of the 2009-2010 season, Upperman, in the region finals. The Lady Bees have handed Cannon County's girl three of their four losses this season. McMinn Central and Polk County are playing in the Region 3-AA finals Wednesday. Chelsey Payne 16 points, 13 rebounds; Erica Melton 11; Emily Sissom 10; Ashley Campbell 6; Taylor King 6, 6 assists; Lindsey Reed 5, Shelby Jordan 5.